Being permanently based in a local New York City high school as an undercover operative has its moments, good and bad, for 16-year-old safecracker Maggie Silver. Pros: More quality time with her former mark-turned-boyfriend Jesse Oliver and insanely cool best friend, Roux. Getting to spend quality time with her semi-retired and international spy honorary uncle, Angelo. Cons: High school and the accompanying cliques, bad lunches, and frustratingly simple locker combinations. But when Maggie's parents are falsely accused of stealing priceless gold coins, Maggie uses her safecracking skills to try and clear their names. Too bad it only serves to put her and everyone she loves in danger. Maggie and her "new team" flee to Paris where they must come up with a plan to defeat their former allies. This book was a nice little light read for me. I know, I know. It wasn't intended to be a light read, but that's what it ended up being in my eyes. Who was the intended audience for this book? Just wondering. I liked Maggie and Jessie Oliver's thing! CUTE! (I can't just say Jesse, it doesn't sound right without the Oliver part). Even with the corny jokes, they just grew on me. I want to pinch their cheeks! They are so adorable! The pacing was just right for me, and I really enjoyed Angelo and Roux's friendship. Can I call it a chess-father-ship? No? Well, back to the review, then. That girl needs all the love in the world, and I'm so happy that Angelo is able to distract her from some of her worries when the time is right. The pacing in the book was alright, but I wished for more action. I understand that I was supposed to get a sense of danger all throughout the book, but I didn't feel that. 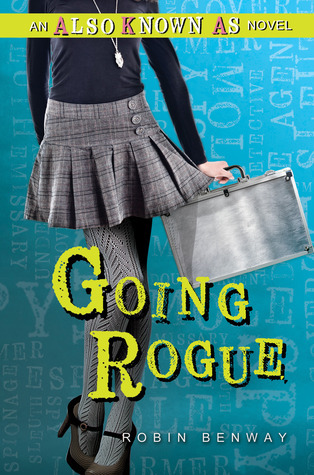 In Going Rogue, Maggie and her parents are "blacklisted." The collective is no longer what it used to be and it gets hard to tell who you can trust. Mags and her parents (along with Roux, Jessie Oliver, and Angelo) get pulled into a conflict that requires them to stand up against the Collective. I think the major problem for me with this book was that I didn't think they were in any actual danger. As gruesome as everything looked, I couldn't believe that any serious harm would come to the characters. I mean, I'm glad nobody died, but I would've wanted to atleast feel as if somebody was going to die. Another problem: Insta-love? Roux meets a guy for the very first time and pretty soon, she's trusting him with all her secrets. Does this happen in real life? I'm sorry for my pessimism, but I didn't buy the whole insta-love story. Sorry. Though with Roux, I kind of let it go a little because that girl has some messed up parents. They barely show any sort of love to her. Those jerks! Plus the guy seemed nice enough.